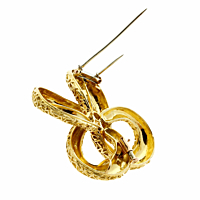 This classic, four leaf gold brooch pendant by Van Cleef & Arpels is finely crafted in 18k yellow gold. 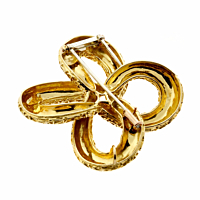 The four interlocking, open loops are slightly concave shaped and adorned with tiny gold geometric elements. 2" in length, it can be worn both as a brooch or as a pendant necklace.